Time: ? ?, but I know I spent way too long on the purple one. 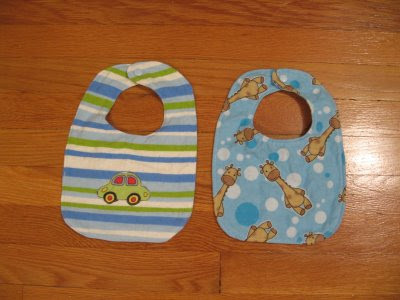 More bibs! The top two bibs were made for my cousin's baby. The purple one was supposed to be for her too, but I didn't like it enough. The one with big flowers I made for Eve. Here are the first pair of homemade babylegs I made. They were from a 2 pack of kids socks I bought at Walmart. 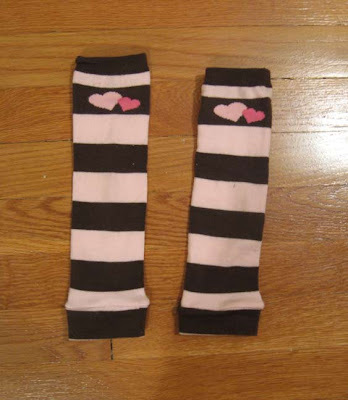 Very quick to make!I just wish it was easier to find cute (especially for boys) inexpensive knee socks. I used a serger and it went very quick. They match Eve's brown dress very well. Conclusion: I love them! Quick and easy to make. I will definitely be looking for more socks to make some more. 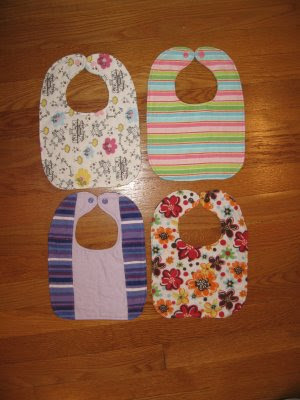 This is my first attempt at making bibs and I really like it! They were easy to make, the came out cute, and were cheap! They made from two layers of flannel from Jo-Anns. The car is another flannel print I cut out and sewed on there, but it doesn't look as good as it does in the picture so I'm not sure I'll do that again. Maybe with a solid color. I put stitching around the giraffe in the front, but It doesn't really do much of anything, so I think I'll use a brighter thread next time. I still think they look great! 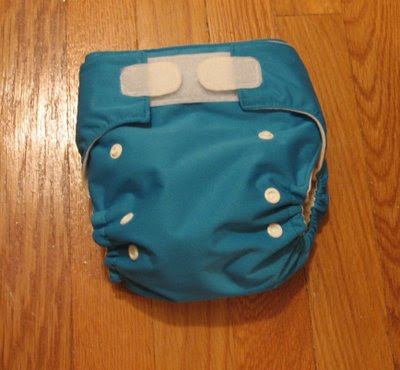 This is the first One-size Pocket Diaper I got to make with my snap press. I used ocean PUL outside and buttersuede inside. I used lastin instead of elastic and I don't think I like it much. Plus I put the TouchTape on the front too high, oh and I meant to put blue snaps on the front... But even with those problems, I still like it! It still looks good and it worked! Yea! Jon doesn't like the touchtape much, he says it too strong, but I think it'll get better. My Sewing Machine is fixed! Cost: Not sure. The fake minkee was leftover from making my boppy cover a while back. Time: Also Not sure. It took forever it seems, due to all the sewing machine problems. 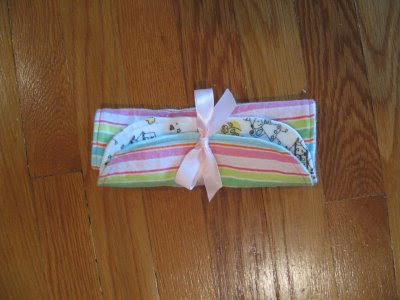 This is the first project I finished with my repaired sewing machine. It was a going to be a diaper for my nephew, but he was born too big to wear it, so I never finished sewing it. I was so glad to get it done, I only had the topstiching left. Before I had the sewing machine fixed I could only get about 1-2 inches done before a thread snapped, or all the stitches started skipping or the thread came off the bobbin tension holder. It was very frustrating. But now... I got it done in one try! Yea! 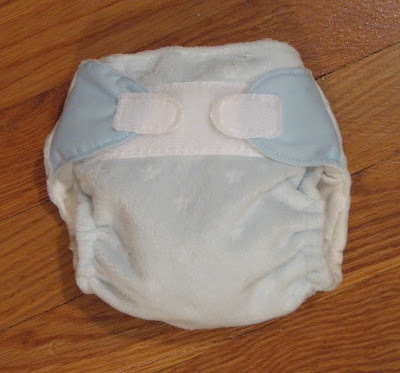 It is a pocket diaper, with buttersuede from Hancocks on the inside. There is a hidden layer of white PUL behind the light blue Minkee. The minkee is acutally a rip-off version at Jo-Anns, and it has blue stars on it, but is still very soft. 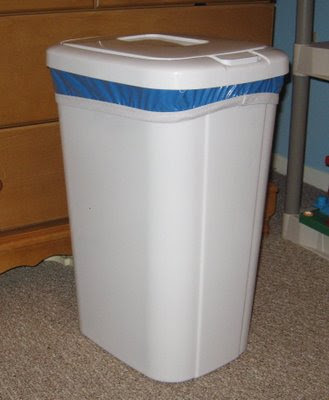 I used Aplix fasteners and I think 1/4" elastic on the inside. 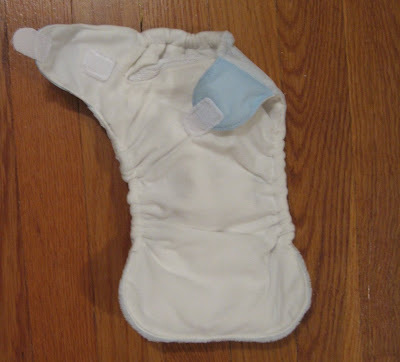 For the tabs, I used baby blue PUL that were scrap from some of the diapers my mom was going to make.